I discovered the Wheel of the Year and The Goddess Wheel in Glastonbury, UK. 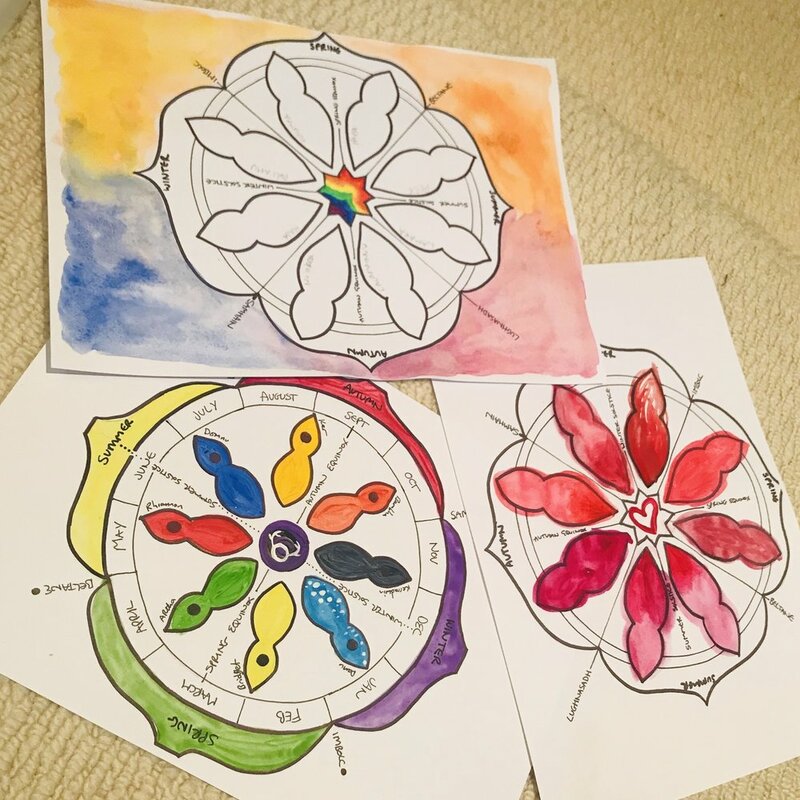 I loved how both ways of viewing the year helped me connect to the seasons and I totally loved creating my own goddess wheels, even though I messed up the dates and layout sometimes and misspelled Lughnasadh at least twenty times! I enjoy the process of setting the year out in seasons, incorporating the goddesses and ancient festivals and sabbats. I want to see your Goddess Wheels and Wheels of the year! create them as flatlays, paintings, sculptures, collage, carvings, digital (go wild! hell, make it from jelly beans if the goddess so inspires you to do so!). Take a picture and write a paragraph or two about your wheel (I’m capping the word count at 1,500 words, to give you an outline, but you can write less or more if needed). Submit to me at sarah@sentiayoga.com and see your work in print! This is an opportunity to share your work, have fun creating a wheel and have your work published and proceeds will go to The Woodland Trust and Refuge. Simply this; to share my love of the Wheels and the Goddess with others by compiling a book. And with which to do some good; both as inspiration and education, and as a way to raise money for two special charities. This is a chance to share your work and thoughts on Goddess Wheels, and see your work published. I would be honoured if you would consider taking part, it's a big dream but I am driven to make it work! I’ll be submitted the project to MBS publishers first, and should that not be successful - Self Publishing. Each page will feature a wheel and the story that goes with it; and then a short bio below your writing! 2) No more than 1,500 words about your wheel; You can write about how or why you made it, the goddesses you included, or a story about why you are inspired by Goddess Wheels! 3) A few lines of Bio about yourself! Wheels of the Year and Season Wheels and any other variations are also very welcome, the Goddess is in all the seasons after all! No royalties are due to authors - profits will go to charities: The Woodland Trust and Refuge.